Quaint theme aside, Village is a worker placement game, with some mild resource management added into the mix. Nothing unusual there, but it is a unique mixture of elements with some brilliant innovations. If you don’t have the resources to pay for something, the game will often offer an alternative – paying with time. Don’t have the materials required to craft that plough? You can send a member of your family to the blacksmith (plough-smith?) to be apprenticed to the craft. Training costs time, but it does mean that from then on, whenever you need a plough, you can just spend more time to make one instead of using actions to gather resources to build one. The catch here is that time is the ultimate finite resource. Once you have ‘spent’ enough time, a member of your family will pass away, leaving you with one fewer workers to place. And four generations is the limit of your family; you can’t simply keep spawning more. On the other hand, when family members die, they can potentially be entered into the village chronicle, and earn you victory points. To add to this again, the game ends when the village chronicle is full, so you can potentially exert some control over the length of the game and force it to end sooner, which might suit you better. So working Grandpa to death at the forge might be the best option for your family. Delightful! After only a couple of plays, all the options in the game seem well balanced, and we haven’t hit on a ‘killer strategy’ that carries with it a greater chance of victory than any other. Your options on any given turn are limited, and dwindle alarmingly as other players remove precious cubes, and potential actions, from the board. You have to be willing to adapt your strategy to suit the games’ flow and the interference of other players. While there is no direct conflict or antagonism between residents, you can’t live in a village that small and not be affected by those around you. You will occasionally rub up against your neighbours, or elbow them on your way to market, eager to get to the good customers first. It’s ages since I’ve seen Village review, haven’t played either, but i was anticipating to see Death in the comic 🙂 Still remember it has interesting mechanics tied to time and death and birth of the workers. Though it may sound a bit grim to some gamers. 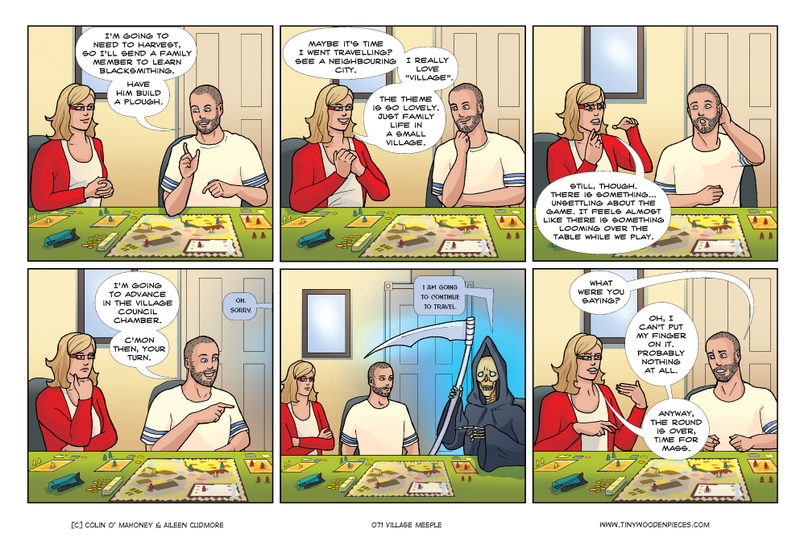 It was inevitable that death would make an appearance eventually. Just like real life, I guess…. I’m quite proud of myself for not making any Bill and Ted jokes. Village is definitely worth trying to track down or play. Odd though it is, we are really enjoying it .